Following the success of Todd’s tour with Jonny Diaz this spring, Todd is going to be doing another fly date tour this fall. 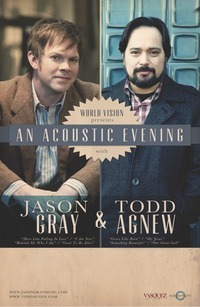 Partnering with him on tour, sponsored by World Vision is Jason Gray. We’ve never had the opportunity of working with Jason before, but we are excited to be providing the Tour Management and FOH work for this entire tour. If you are interested in attending this show, click here for all tour dates. Or if you would like more information about World Vision, we encourage you to look into their ministry. Keep an eye out for a show in your area!